Bishop Richard Malone, leader of the Catholic Diocese of Buffalo, announcing the $100-million campaign. Diocesan and campaign leaders joined Bishop Richard Malone to announce the campaign. 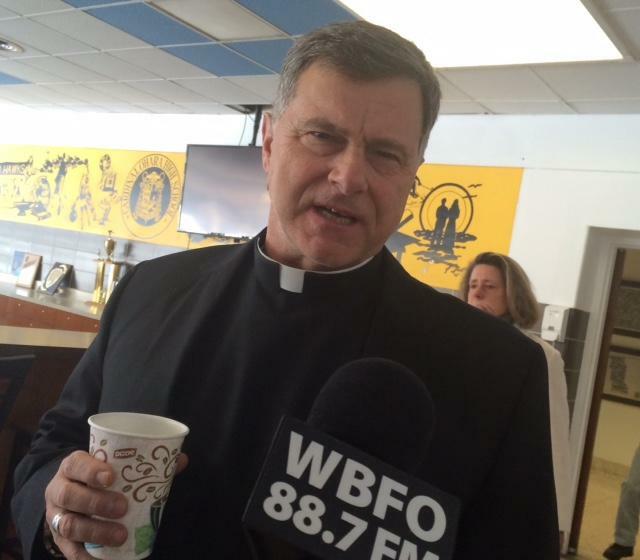 Malone said it will take place in all 164 parishes across Western New York. “This campaign jointly addresses our individual parish needs and establishes long-term, sustainable funding for our ministries regardless of your parishes size, demographics or location,” stated Bishop Malone. 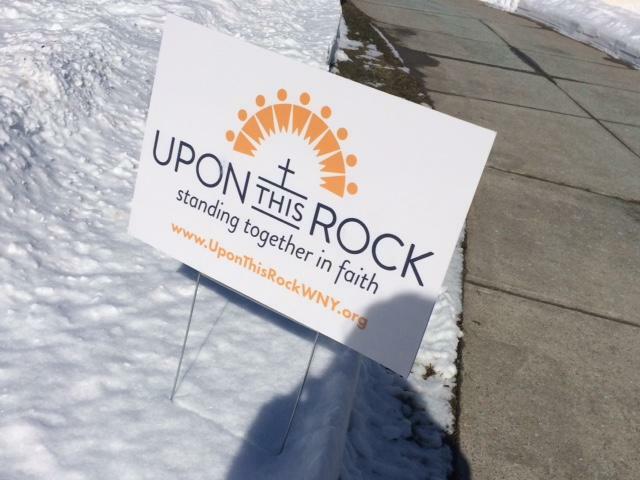 The Catholic Diocese of Buffalo launches 'Upon This Rock' campaign. Thirty-five percent of the funds raised will go directly back to parishes. The funding will support pastoral, social service and education. Bishop Malone described it as a "bold endeavor." "To intentionally reshape the future of our church and strengthen the funding of key ministers and programs," said Malone. 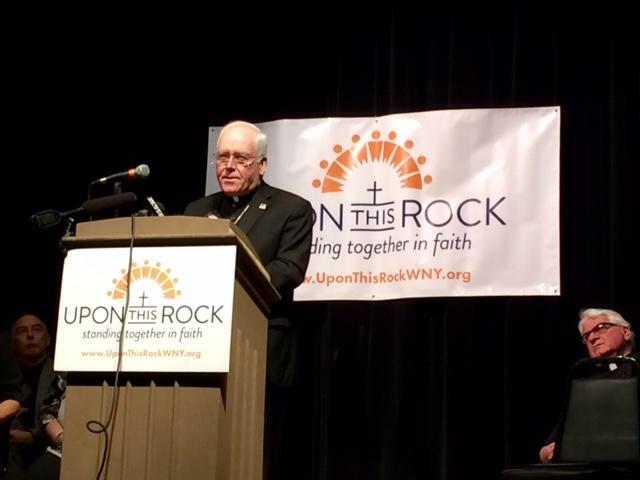 Bishop Richard Malone, leader of the Catholic Diocese of Buffalo, talks with reporters about 'Upon This Rock'. In the past ten years, the Buffalo Diocese has lost population in churches and schools, forcing closings and consolidations. "The enrollment needs to go up, and a big part of that is tuition assistance. That's why a major piece of this campaign is to have endowed funds to help families," said Malone. The campaign will work to raise $17-million for Catholic education and include the creation of a permanent endowment for tuition assistance. 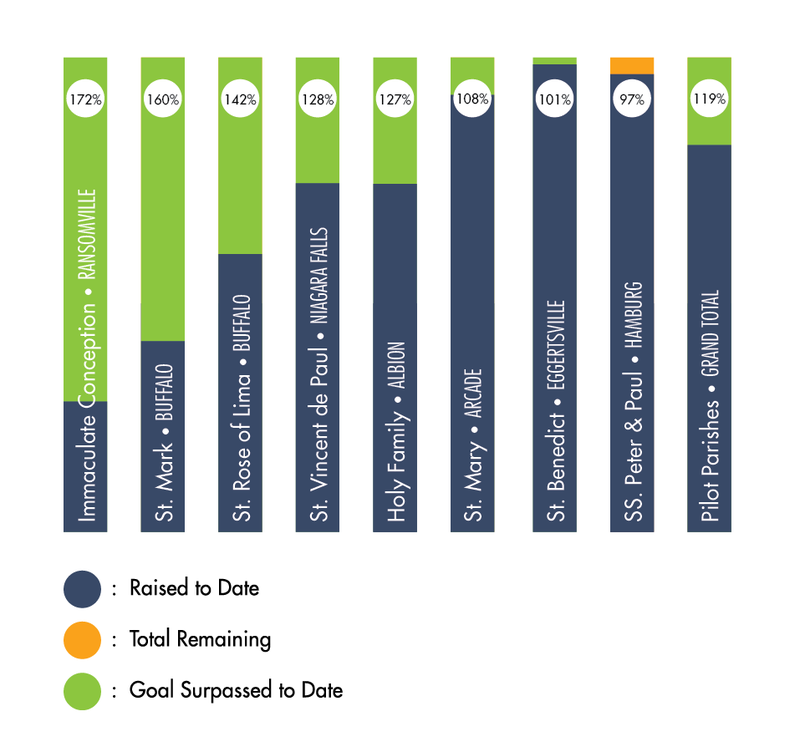 Eight parishes have already participated in a pilot program raising more than $28 million from 2,800 gifts to jumpstart the campaign. Upon This Rock started in eight parishes. 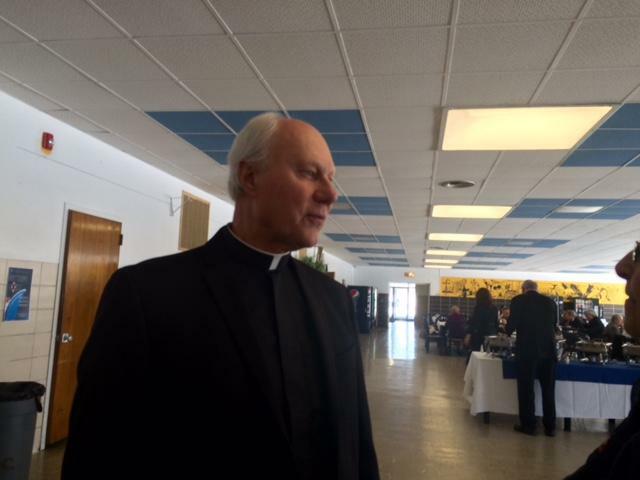 WBFO News spoke with two priest who participated in the pilot program, Father Robert Mock, Pastor of St. Benedict in Amherst and Father Joe Rogliano, Pastor of St. Mark and St. Rose of Lima in north Buffalo. Both said the campaign allowed them to reconnect with parishioners. "It was really great to the people of the parish on a whole different level and understand different things about their lives that I never knew before, so from that aspect it was as great opportunity to just meet and have an opportunity to talk with them," said Mock. "Even for a smaller parish, like mine two, to sit for 45 minutes to an hour with your parishioners and just talk and introduce the campaign, and I found to, not only did love that, they appreciated, I think for the most part, being invited to learn about the campaign," explained Rogliano. Father Joe Rogliano, Pastor of St. Mark Church & School and St. Rose of Lima Church in north Buffalo. Both Mock and Rogliano also have parish schools and believe the endowment for education is needed. "And so for us that was a pretty strong point because we are ensuring the future of all the schools in the Diocese, but specifically our school," noted Mock. "And also, I think it was wise that a portion comes back to the parish. It gives them ownership. 35-percent, until you meet goal. If you meet goal it magically becomes 55-percent of every dollar, so that's wonderful," said Rogliano. Bishop Malone explained to reporters the new effort is separate from the annual Catholic Charities drive, but will help strengthen the yearly Appeal. Malone noted the Diocese has a "mechanism' in place to protect the Appeal. "The first monies that will come in for the capital campaign, for Upon This Rock, will go toward their parish goals, for example for Catholic Charities, so we have everything in place that we could devise to make sure the Catholic Charities Appeal doesn't suffer from it," said Malone. One of the most diverse populations of students can be found inside a west side Catholic elementary school in Buffalo. Many students at Our Lady of Black Rock are able to attend through the Catholic Diocese Bison fund. WBFO's Focus on Education Reporter Eileen Buckley visited the school to find out how educators are engaging students despite high poverty and language barriers. 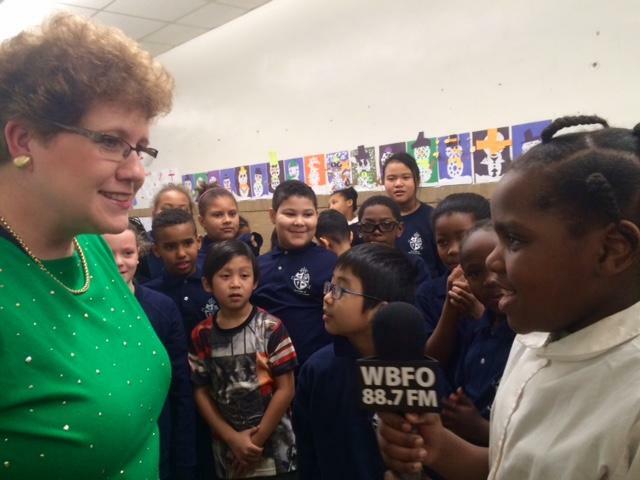 WBFO'S Eileen Buckley visits Our Lady of Black Rock School, where students from high poverty are inspired to learn.